Like the handshake, the gun salute is said to have begun as a sign that the saluter is unarmed and means no harm. In gunnery's early days reloading was a lengthy process, and a ship that had just fired all its cannon would not be able to repeat the performance for a quarter hour or more. Salutes ordinarily consist of an odd number of shots, following a naval tradition dating back at least to the middle 1600s. An even number of shots was considered unlucky, and sometimes used as a signal that the captain or master gunner had died on the voyage. In the days when Britannia ruled the waves it compelled passing merchant vessels to salute its warships, firing first. Even British merchants complained of the expense. The British national salute was 7 guns, but those ashore (where powder was more easily come by) could return 3 shots for every 1, in other words, 21 shots. As relations between nations became more egalitarian, it became customary to reply to a salute with the same number of shots. At the suggestion of the British, the United States adopted the international 21-gun salute and the principle of “gun-for-gun return” on 18 August, 1875. Some of the present entitlements in U.S. military usage are described below in simplified fashion. For example, the Secretary of Defense is entitled to 19 guns on arrival and departure, but other cabinet members only on arrival. Traditionally, and in the absence of a watch, the master gunner times the interval between shots by saying, “If I weren't a gunner, I wouldn't be here. Fire one” (two, three, etc). Who is entitled to this salute? U.S. presidents, ex-presidents, and presidents-elect. Chiefs of state, heads of government, members of a reigning royal family. In the United States, a 21-gun salute is fired on Washington's Birthday and Memorial Day. U.S. officers abroad may salute any dignitary in his or her own country with the number of guns with which that country salutes that person, up to a 19-gun salute—but not a 21-gun salute, unless the person falls into one of the above categories. U.S. Vice-President, Speaker of the House, President pro temp of the Senate, Chief Justice, Cabinet officers. Governor of a U.S. state. Deputy Secretary of Defense. Director of Defense Research and Engineering. Chairman of the Joint Chiefs of Staff. Chief of Staff, U.S. Army. Chief of Staff, U.S. Air Force. Chief of Naval Operations. Commandant of the Marine Corps. Officers above the rank of admiral or general, i.e., Fleet Admiral, General of the Army or General of the Air Force. Ambassadors, high commissioners, and others whose credentials are at least equivalent to those of an ambassador. 17-gun Governor general or governor of a territory, commonwealth, or possession of the U.S. or an area under U.S. administration. Committee of Congress. Assistant Secretaries of Defense, General Counsel of the Department of Defense, Under Secretaries of the Army, Navy, or Air Force. Admiral, General. 15-gun Envoy extraordinary and minister plenipotentiary. Vice admiral, lieutenant general. 13-gun Minister resident. Rear admiral, major general. 11-gun Charge d'Affaires, Consul general, consul, or vice consul when in charge of a consulate-general. Brigadier general. 7-gun Consuls accredited to the U.S. Vice-consuls when in charge of consulate. 5-gun Vice-consuls and consular agents. Certain special salutes are traditional in some countries. In the United States, on July 4th a salute is fired consisting of one gun for each state in the Union. (One-gun-per-state was for many years the United States’ national salute, John Paul Jones having returned a 13-gun salute to the French salute to the Ranger at Quiberon Bay in 1778, the first time a United States warship was saluted as that of a sovereign state. The 1-gun-per state salute was officially adopted in 1810, but it become increasingly cumbersome as more states joined the Union, and in 1841 the national salute was reduced to 21 guns.) During the period of British rule in India, the King-Emperor received a salute of 101 guns. U. S. Army Regulations 600-25. Officers manual. U. S. Dept. of Defense. William P. Mack, Royall W. Connell and Leland Pearson Lovette. 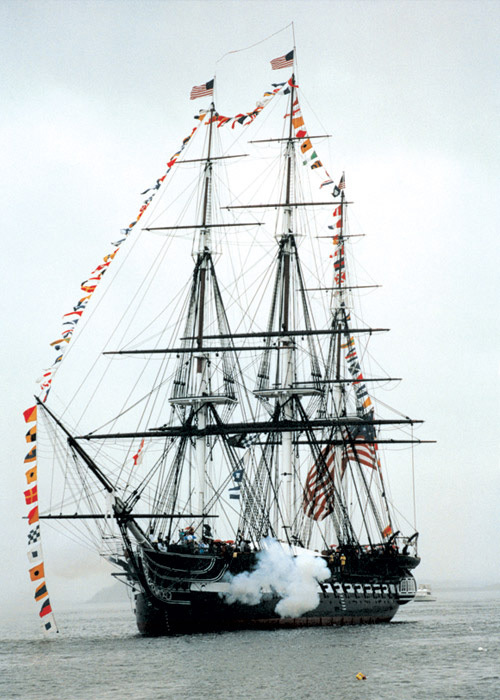 Naval Ceremonies, Customs, and Traditions. 5th ed. U. S. Naval Institute, 1980. When a flag-officer salutes the admiral and commander-in-chief of the fleet, he is to give him fifteen guns, but, when captains salute him, they are to give him seventeen guns. The admiral and commander-in-chief of the fleet is to return two guns less to flag-officers, and four less to captains. Flag-officers, saluting their superior or senior officers, are to give them thirteen guns. Flag-officers to return an equal number of guns to flag-officers, bearing their flags on the same masts, and two guns less to the rest, as also to captains. When a captain salutes an admiral of the white or blue, he is to give him fifteen guns; but to vice and rear-admirals, thirteen guns. When a flag-officer is saluted by two or more of his majesty's ships, he is not to return the salute until all have finished, and then to do it with such a reasonable number of guns as he shall judge proper. In case of the meeting of two squadrons, the two chiefs only are to exchange salutes. And if single ships meet a squadron consisting of more than one flag, only the principal flag is to be saluted. No salutes are to be repeated by the same ships, unless there has been a separation of six months at least. Captains are not to salute one another. A flag-officer commanding in chief, upon the first hoisting his flag, is to be saluted by all the ships present with such a number of guns as are prescribed in the above regulations. Foreigners meeting with any of his majesty's ships within his majesty's seas, as far as Cape Finisterre, are expected to take in their flag and strike their topsail; but, on refusal, are to be compelled to it, and not be suffered to do any dishonour to his majesty. His majesty's subjects are also to strike their topsails in passing by any of his majesty's ships; and, on omission, the master of such ship is liable to be proceeded against in the high court of admiralty. His majesty's ships are not to strike to any; and that, in other parts, no ship of his majesty's is to strike her flag or topsail to any foreigner, unless, such foreign ship shall have first struck, or at the same time strike, her flag or topsail to his majesty's ship. Upon all occasions, flag-officers and commanders of his majesty's ships are to maintain his majesty's honour, give protection to his subjects, encourage them in their lawful commerce, and not injure his friends and allies. A foreign admiral shall receive gun for gun; if he be a vice-admiral, the admiral is to return two less; if a rear-admiral, the admiral and vice-admiral shall return two less. If the ship be commanded by a captain only, the flag-officers shall return two less, and captains an equal number. Any of his majesty's ships coming to an anchor in a foreign port or road, within cannon-shot of its forts, the captain may salute the place with such a number of guns as has been customary, on good assurance of having the like number returned. but not otherwise. But if the ship bears a flag, the flag-officer is first carefully to inform himself how flags of like rank, belonging to the other crowned heads, have given or returned salutes, and then to insist upon the same respect. Admirals, commanders-in-chief, or captains of ships of war, of foreign nations, foreign noblemen, and strangers of quality, also the factories of the king's subjects, coming on board to visit the ship, may be saluted by the commanders of his majesty's ships, with a number of guns at discretion suitable to the occasion and quality of the visiting persons; but such commander is nevertheless accountable for any excesses in the abuse of this liberty: and if any commander or senior captain be present, his leave and consent must be had. Merchant-ships, whether foreigners or subjects, saluting the admiral of the fleet, are to be answered by six guns less; from other flag-ships by four less, and from captains by two less. If several merchant-ships salute in company, no return is to be made until all have finished, and then by such a number of guns as shall be thought proper; but, though the merchant-ship should answer, no second return is to be made. Dukes or ambassadors, at coming on-board, and also at their departure, are to be saluted with fifteen guns; other public ministers or persons of quality, with eleven or less, according to the degree of their quality. But nothing is here to be understood to restrain commanders in their respect to any of the royal family, who are always to be saluted at the discretion of the commander-in-chief. The anniversary days of the birth, accession, and coronation, of the king, the birth of the queen, restoration of king Charles the Second, and Gunpowder-treason, are to be solemnized by his majesty's ships, if they are in port, with such a number of guns as the chief officer shall think proper, not exceeding twenty-one each ship. His majesty's ships of war are not to salute his majesty's forts or castles in Great-Britain or Ireland. When a flag-officer or commander-in-chief dies at sea, or in a road, at the putting of the corpse into the sea, or carrying it on shore, the commanding-officer shall cause such a number of guns to be fired, funeral wise, from the ships in company, as he shall think proper, and the flag to be struck half mast. At the funeral of a captain dying at sea, or in a road, the commander-in-chief shall appoint such a number of guns as he shall think fit, not exceeding twenty, to be fired from the ship he commanded, and the pendant to be lowered down. If the ship be alone. the next surviving officer is to cause the same to be done. At the funeral of a lieutenant, dying as before, there shall be fired, from the ship he belonged to, three vollies of small arms, by the direction of the commander-in-chief, or of the captain, if the ship be alone. No merchant-ship is to fire guns in any road or port after the watch is set, if any of his majesty's ships be there. All salutes are to be made with guns of the upper-deck. The Ship-Master's Assistant and Owner's Manual. 9th edition. London: Printed for David Steel, at the Navigation-Warehouse, 1801. Last revised: 29 August 2012.